With the Livingston County Fair and Missouri State Fair approaching, members of 4-H and FFA have the opportunity to complete papers for showing livestock at both fairs. 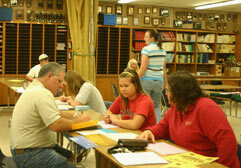 This year’s sign-up was held at Grand River Technical School on Thursday. Here, sisters Abby Sallee and Emily Sallee complete the necessary paperwork with assistance from FFA Adviser Rusty Black. 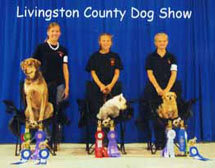 The top three exhibitors of the 2008 Livingston County 4-H and FFA Fair dog show are, from left: Jessica Boyer of Double H 4-H for overall showmanship, Alicia Kieffer of Double H 4-H for sportsmanship, and Jessica Paul of Busy Bee 4-H for high point obedience. Rex Nelson, of Palmyra, inspects a hen entry in the chicken show Wednesday afternoon at the fair. There were around 150 entries in the chicken show. The poultry and goat shows were held at the Livingston County 4-H and FFA Fair Wednesday afternoon with 80 goats and 150 poultry entries being judged. Goat numbers were up this year, reflecting an upward trend over the last few years. “There were a lot of quality animals here,” said Fair Board member Steve Haley who coordinated the goat show. 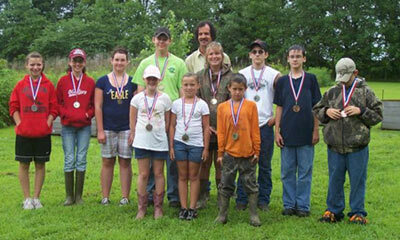 “The judge was impressed with the facility and the animals.” The judge was J. Barry Watts, of Rogersville. 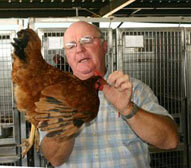 There were 150 entries in the poultry show Wednesday afternoon. Rex Nelson of Palmyra served as the judge. 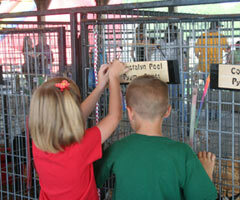 “We had a good turnout and had a great show,” said Beth Weidner, who helped coordinate the poultry shows. The broiler chicken show — a first for the county fair — was held on Monday with 11 entries. Weidner said the broiler chicken show will likely be held again next year. “The show was educational and the judge was helpful,” she said. In the broiler show, Wesley Helton showed the grand champion and Ashley Yardley showed the reserve grand champion. Jared McCauslin’s Grand Champion Steer overall and was one of 25 steers sold at Friday night’s animal sale which capped-off a week of activities at the Livingston County 4-H and FFA Fair. 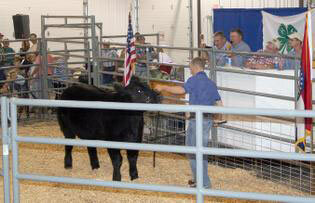 The second year at the new Livingston County 4-H and FFA Fair Grounds brought in the second largest sale in history. 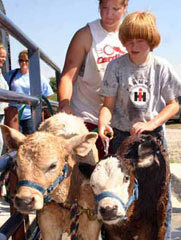 The 2008 fair ended Friday evening with the sale totaling $98,955 just short of last years total of $115,249. The fully air-conditioned Mervyn Jenkins Expo Center was a cool place for hot bidding and generous supporters reached deep into their pockets to far exceed the floor price for steers, sheep and hogs. Steers, with a floor price of 95 cents per pound, brought an average of $1.69 per pound. Lambs, with a floor price of 90 cents per pound, sold for an average of $3.37 per pound. Hogs, with a floor price of 48 cents per pound, sold for $2.07 per pound. In all, there were 75 buyers for a total of 25 steers, six lambs, 72 hogs, one rabbit, nine chickens, seven hams and 19 goats. The Mervyn Jenkins Expo Center is a 28,000 square-foot facility featuring an 8,000 square-feet multi-purpose center and show ring fully enclosed and supplied with heating and air conditioning. That’s where the annual appreciation picnic and market sale took place Friday night. The sale followed. Local auctioneers Lonnie Sewell and Bob Peniston volunteered their time to call Friday’s sale. Last year’s sale, which had broken all previous records, brought in $115,249. Last year, there was 11 more steer, three more lambs, six fewer hogs, seven fewer chickens, three fewer hams and six fewer goats and one more rabbit. Of the 25 steers sold, there were 15 premium. The average weight was 1,190 pounds, while the average price per head was $2,005.51. The average price per pound of $1.69, while the average margin over floor price was $657.73. There were 72 hogs sold on Friday, 52 of them being premium. The average hog weight was 250.13 pounds. The average price per head was $518.51, while the average price per pound was $2.07. Average margin over floor price was $519.40. Six sheep sold at the auction, all of which were premium. The average weight was 127 pounds and the average price per head was $428.17. The average price per pound was $3.37 and the average margin over floor price was $473.76. Other animals sold during the auction included nine broiler chickens for a total of $1,900 and 19 goats for a total of $4840.75. Seven hams were also sold for a total of $1975 and one rabbit was sold for $200. 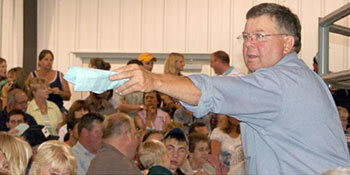 Local auctioneer Lonnie Sewell worked the floor at the animal sale. The other auctioneer of the sale was Bob Peniston.